So you’re getting more serious about your diving and underwater photography – perhaps even fanatical about it. Hopefully you have mastered the art of buoyancy control and learned that the slower the dive the better the dive will be. 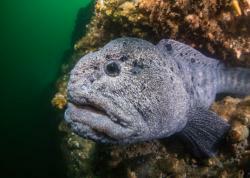 If you’re concentrating on Macro or Super Macro you could easily spend the whole dive searching the nooks and crannies in a less than twenty square foot area. 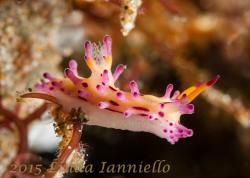 That is when you will start to see and find the likes of the Secretary and Spinyhead Blenny. Secretary and Spinyhead Blennies are both tube blennies in the genus Acanthemblemaria and are closely related. 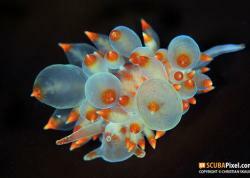 As the description suggests, they live in the vacated tubes of Calcareous Tube Worms and seem to prefer locations in plenty of light at the top of coral heads. At no more than two inches in length they are very hard to see and even harder to tell apart. 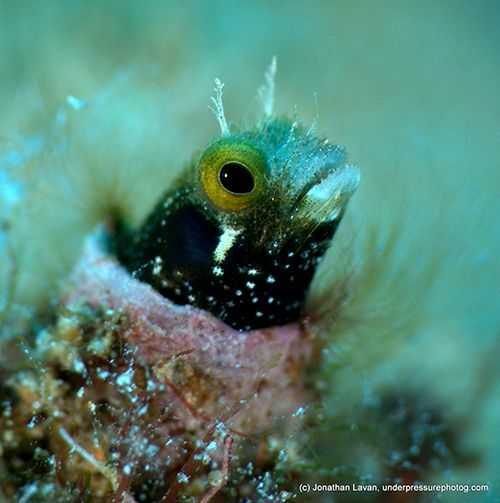 Blennies’ eyes can function independently, giving them that goggle-eyed look that enables them to look in two directions at the same time, keeping careful track of both prey and predators. 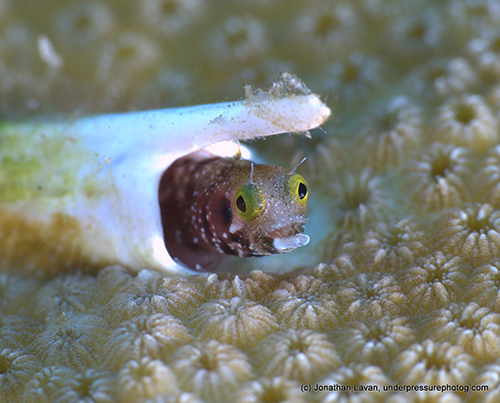 The most effective way to tell a Blenny from other small fish, such as Gobies, is by their cirri. Cirri are the antennae-like projections on top of the head and frequently the snout of all Blennies. These can vary wildly in size and shape depending on species. It is believed the cirri are an additional sensing organ that helps the blenny know which way the water is flowing, enabling them to read the current and know which way the food will be coming from, as well as to help them to anticipate the approach of predators. 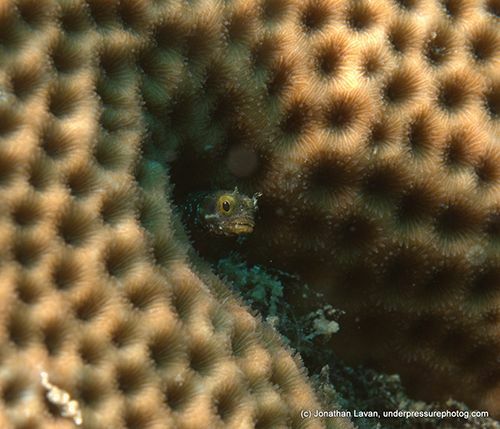 If you watch long enough, you will often see a blenny dart out of its hole and grab a meal out of the water column. The only other time you might see Blennies out of their hole is if a territorial dispute were to occur. 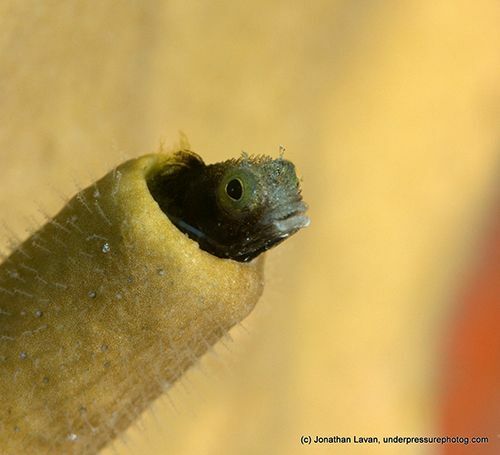 Sometimes a Blenny will decide that he likes his neighbor’s home better than his own – then the games begin. If you are lucky enough to catch two of these tiny titans locked in battle you are sure to get some great photos. Whether perched on their pectorals watching, feeding or fighting these truly animated little fish put on quite a show. On a Caribbean coral reef it’s often the smaller creatures that are harder to find who engage in fascinating behavior and create great photo opportunities. Blennies, with all their fussy behavior and animated features, will provide all the macro opportunities you are looking for. Interested in diving the Caribbean? Our sister company Bluewater Travel can book your next dive trip for you, and it won't cost you more. Their website has resort & liveaboad reviews, dive site maps, underwater videos and more.